Primary Care Partnerships (PCP) planning must align with the Department of Health and Human Services guidelines, the Victorian Public Health and Wellbeing Plan 2015-19, the Municipal Health and Wellbeing Plans 2017-21 of their shires and address evidence based health and wellbeing for communities. The Central Victorian Primary Care Partnership’s (CVPCP) planning process is evidence based. 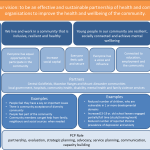 We have used our community health and wellbeing profiles and other sources of population based data; consultation and involvement with our shire forums and discussions with our partners and other key agencies to define our priority populations and issues. 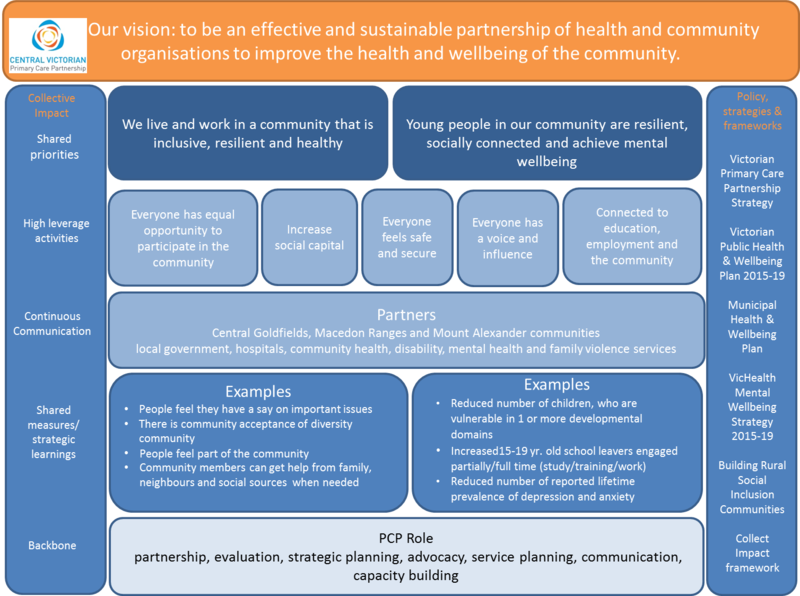 CVPCP works with local and regional agencies to ensure a social inclusion lens is applied to projects. programs and planning, and to collectively pursue our vision that we live and work in communities that are inclusive, resilient and healthy. Our health and wellbeing partnership plans (see below) acknowledge that all partners have a leadership role to play in ensuring our diverse communities can live a full and healthy life. As such, we have committed to applying a social inclusion lens to all of our work in these plans. This commitment will be enacted by utilising the document Building a Socially Inclusive Rural Community: A Complete Resource. In each of our 3 shires our partners have come together to produce a single plan capturing prevention and health promotion priorities and activities from 2017-2021. This supports a systems approach to place-based prevention. 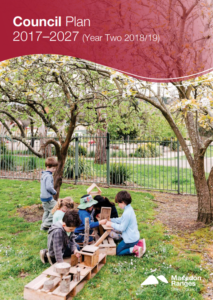 Aligning with Municipal Public Health and Wellbeing Plans, these documents encompass Integrated Health Promotion Plans, PCP prevention plans and local government implementation plans. 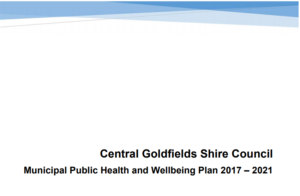 Each council’s approach and strategy to health and wellbeing is documented in their Municipal Public Health and Wellbeing Plan (MPHWP). The MPHWP sets the broad mission, goals and priorities to enable people living in the municipality to achieve maximum health and wellbeing. 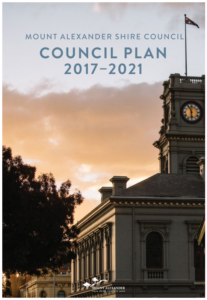 In Macedon Ranges and Mount Alexander Shires, MPHWP are integrated into the broader Council Plans.